Before becoming qualified, each InnerArmor film is subjected to rigorous testing in Sub-One laboratories. This means in-depth measurement of the film’s thickness, hardness, modulus, toughness, adhesion, wear, coefficient of friction, strain, corrosion resistance, erosion resistance and more. To do that, Sub-One laboratories are equipped with state-of-the-art test equipment, and film properties are measured following ASTM specifications whenever possible. To determine thickness, a ball of known diameter is used to wear through the film and thickness is computed by geometry. Sub-One uses a micro-indenter to measure hardness and modulus by driving a diamond tip into the film at a set force. 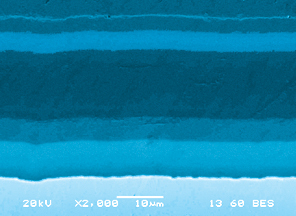 To measure adhesion strength, a diamond stylus is repeatedly drawn across the film surface at a fixed rate and under progressive loading, until the critical load first delaminates the film. A linear reciprocating tribometer is used to measure wear resistance and coefficient of friction. 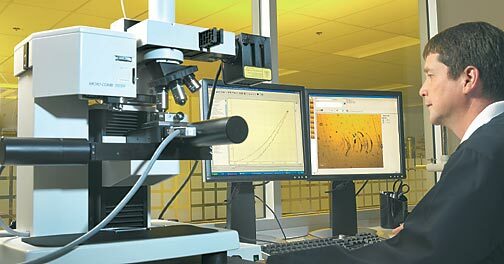 In developing corrosion-protection coatings, Sub-One uses two methods to measure the porosity and corrosion resistance of films. The first is an electrical test for pinholes, the second is the application of strong acids. To test erosion, Sub-One has constructed a special test apparatus (with ASTM specifications) that can control sand flow rate, velocity and impact angle. The more testing done on InnerArmor internal coatings, the more advantages that are noted over techniques such as electroplating, ceramic coating, HVOF sprays, hard chrome, CVD, polymers and others used in the past. photo shows a four-layer film.